A wide variety of creative material options for garden borders, edges or paths! 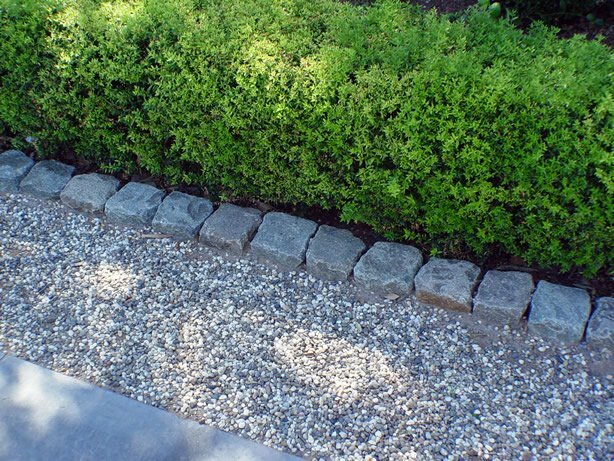 Reclaimed cobblestone is creative and impressive material to use for garden perimeter border edging or to edge pathways. The image above shows how effective raised cobbles can be to retain decomposed granite or gravel. Available from our Historic European Cobblestone collection, in either granite (porphyry) or old sandstone, traditional squares cobbles in 5×5, 6×6 or 7×7 or rectangles in 4×7 or 5×8 all can be set on a concrete bed, elevated or used as a border. In addition to classic reclaimed cobblestone, old limestone curbing is equally charming and available in various lengths. The heights can be left natural or sawn to your requirements. To handle curves in your garden, we also have extremely large granite rectangles (6″ wide x 12″ long x 12″ high) which are great options for curb and edging. These pieces are smaller than the limestone and allows more flexibility with design, especially small curved areas. Bricks: lay flush or raised.